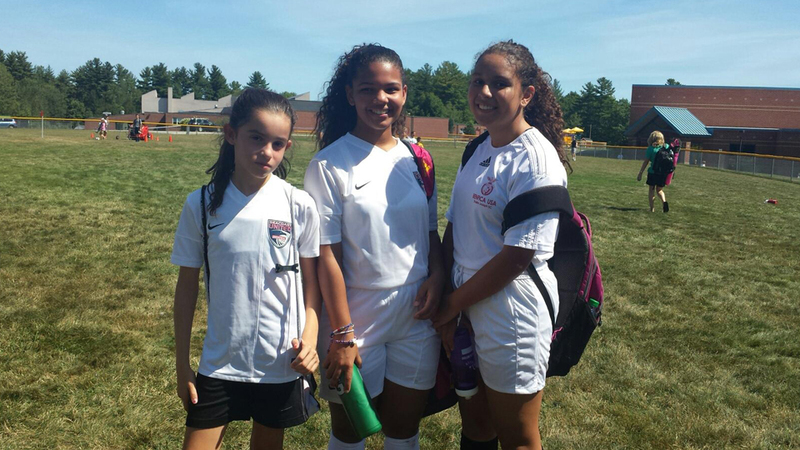 Beyond Soccer also provides Lawrence travel players with opportunities to play outside of Lawrence in more challenging soccer leagues, including Maple (club soccer) and the Massachusetts District Select Program. Because the annual costs associated with most of these leagues is quite high (i.e. some annual costs are in excess of $5,000), we look for partners who can subsidize scholarships. In May 2011, eight (8) kids on our U-14 travel squads tried out for the MYSA District Select summer program and two (2) players were selected. Congrats to William and Hugo who made the boys U13 District Team! In summer 2012, a total of four (4) players were selected. Oriagna and Mariah were the first Lawrence girls to participate in this competitive league.It has been exciting to watch our players develop their skill and compete at the next soccer level. Our numbers keep on growing. We are grateful for our partnership with the Benfica USA Club, a soccer club that has worked with our organization to make club team opportunities a reality for our passionate and talented soccer players. As an example, Pedro received a scholarship to play for the U-13 Benfica team in spring 2012. He has now had two successful club season. In fall 2012 four (4) more U-12 players were connected to the Benfica USA program [Owen, pictured to the right is one of those players]. We are also hopeful that a new relationship with Seacoast United will result in winter indoor club training for some of our youngest U-6 and U-8 players.